You’re most likely visiting Istria for the coastline but don’t miss out on inland Istria, just short distance from the coast. With its rolling green hills, historical hilltop villages, prominent grapevine and olive roads, and gourmet konobas serving delicious Istrian dishes, central Istria is not to be missed. One visit to Central Istria and you’ll see why many are referring to this region of Istria as the new Tuscany or Umbria. - Oprtalj: Oprtalj is a picturesque town with panoramic views not far from Motovun. It is best known for three churches dating back to 15th and 16th centuries with frescoes: St. George, Blessed Virgin, and St. Rocco. Oprtalj is also known for its famous Chestnut Festival (Chestnut Fair or Kestenijada) held in October. - Svetvincenat: Svetvincenat is the best representation of Renaissance architecture, which is uncommon in Istria. Visit the renaissance square “Placa” for a celebration of the Renaissance period. Also visit the Morosini-Grimani castle with Venetian architecture. The New Wine Festival in October is a popular event that has been held for over 40 years celebrating the wine makers. - Visnjan: Visnjan is a town with a rich cultural heritage. In nearby village Strpacici, copper earrings and needles from the Bronze Age were found. Visnjan is also home to the famous Visnjan observatory in Istria. Astrofest is a popular event celebrating the summer solstice, June 21 and 22. - Vizinada: Visit Vizinada, a town on the hill rising above the Mirna valley, for panoramic views of Green and Blue Istria. - Zminj: Zminj is the geographical center of Istria and the main historical intersection of roads in Istria. Main attractions are Festinsko Kraljevstvo cave tour and three small churches (Holy Trinity, St. Cross, and St. Anthony the Monk) painted in frescoes. Also, every last Saturday in August, Zminj hosts the biggest folk fest festival of Istria. - Gracisce: Visit the nearby 12th century village with Venetian homes. Also check out Palace Salomon in Main Square and the parish church St. Mary na Placu, featuring frescoes and nails in the walls which, as legend has it, helped women get pregnant. The St. Simon walking trail takes you on a nice tour that includes a waterfall. - Kringa: Visit the nearby village of Jure Grando, Europe’s first vampire. Legend has it that vampire Grando brought terror to the families of this town for 16 years after his death. Villagers opened the coffin to discover his body still intact. Only after they beheaded his corpse did the terrors stop. There is a Vampire Museum next to the village’s Vampire Cafe that you can visit. - Sveti Petar u Sumi: This nearby village was named for its Benedictine monastery that dates back to 1174. Unlike other villages and towns of Istria, there are no houses around the church or monastery in this village. Legend has it that the Hungarian King Solomon spent some time here in the 11th century after he was dethroned in dynastic struggles. - Zavrsje: Mystical, abandoned Medieval village surrounded by ancient walls and towers. - Roc: Roc is a famous Istrian cultural center and has been the center of the Glagolitic literature since the 13th century. Roc is also well known for its folk music tradition centered on triestina, a type of accordion. The International Accordion Festival held during the second week in May is a great time to see the folk music live. - Hum: Hum is the smallest town in the world, a spectacle in itself. When in Hum, also visit the Glagolitic Alley, a 7-km long trail that connects Hum with Roc. It consists of 11 sculptures created in the 1980s as copies of important Glagolitic scripts. Glagolitic alphabet was an archaic Slavonic script that was used by Istrian priests from Middle Ages until 19th century. - Kotli: Spend quiet time in the isolated village by the waterfalls of the Mirna River, and enjoy the open-air Jacuzzis created by the waterfalls. There’s also a historic water mill that was in operation until 1964. - Tinjan: Best known for the Istrian prsut (dried ham) festival in October, the Istrian house from 1442, and the round stone table with 12 stone seats where important decisions used to be made. - Draguc: Draguc is also known as “Istrian Hollywood” because many films have been filmed in this town. In Draguc you’ll also find many beautiful frescoes and will enjoy beautiful views from the hill. - Sveti Lovrec: Sveti Lovrec is located near Vrsar and Porec, and is one the best preserved medieval fortified towns in Istria. Pazin is the administrative capital of Istria. Pazin has been called the “heart of Istria” since the 19th Century because of its central location. The Pazin Castle was first mentioned in 983. During its 11-century-long history, the Pazin Castle was subjected to several major reconstructions and renovations. The castle is now home to the Ethnographic Museum of Istria and Pazin Town Museum. In the surrounding area of Pazin, there are many medieval towns holding secrets and treasures that make them worth visiting. - Pazin Castle: Best preserved castle in Istria with two museums inside. - Ethnographic Museum of Istria: Inside the Pazin castle. Documents history of Istria. - Zip Line Pazinska Jama: Two zip lines with great views. - Pazin Cave: Pazin cave inspired the work of authors Jules Verne, who mentioned Pazin in his novel Mathias Sandorf but never visited Pazin himself, and Dante Alighieri, who lived in Pula during his exile and was inspired by the Pazin cave in describing the gateway to Hell in Inferno, the first part of his epic poem Divine Comedy. Fun activities include walking and zip lining inside the cave, and Speleo Adventure. - Church of St. Nicholas: Built in 1266 in Romanesque style, the church houses frescoes from 15th century. - Motocross Park Santarija: Take a ride on a dirt bike track. - Church of St. Mary: See 15th century frescoes at the Church of Mary at the nearby Beram, including the Dance of Death fresco. - Restaurants: Best restaurants are listed in Chapter 31. You can find other recommended restaurants in the Best of Istria Google Map. - Accommodation: Hotel Lovac and Resort Cize. Elevate your taste buds with some of nature’s most exclusive and expensive mushrooms in the ‘City of Truffles’, Buzet. Dogs scour the forests around this northwestern city for the world’s most highly prized truffles. Truffle business is lucrative as one kg of ruffles can cost in excess of $3,000. 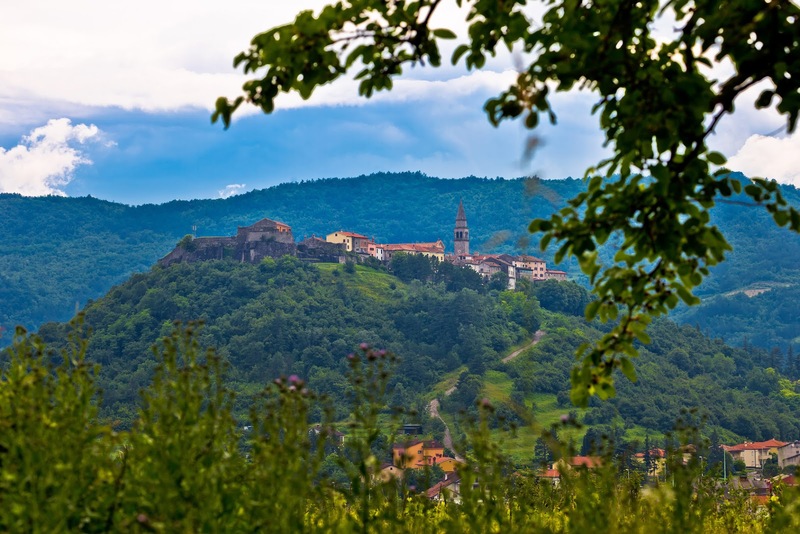 In Buzet and Motovun, group truffle tours teach tourists about this prized chef’s ingredient and why it is so important to the area. Every September, celebration of the white truffle season brings fans from far and wide, through the end of the season in December. This pleasant city, shaped by ancient Roman settlements then refined by the Venetians, quietly invites exploration of its charming streets and historic buildings. The new part of the town sits at the base of the hill, but the short walk up is worth the effort. Rewards include a peaceful walk over ancient cobblestones, steeped in the history of the ages. - Truffle Hunting: Buzet is known as “Truffle City.” Truffles are highly prized for their exquisite taste and aroma, and can be found in the surrounding area. Go truffle hunting in the Buzet area with Prodan Tartufi or Karlic Tartufi. - Truffle Tasting: You can find a variety of truffle products to taste at Natura Tartufi and Zigante Tartufi. - River Mirna: Nice views from this hill town situated right above the Mirna River. - Buzet Region Museum: The museum in the Palace Bigatto houses pagan artifacts and items from the Roman period. - Subotina Festival: September celebration of old crafts and fashion. - Fritaja Event: Each September, Buzet citizens make a huge omelet feast with more than 2,000 eggs. - Aura Distillery: Sample various brandies of Istria. 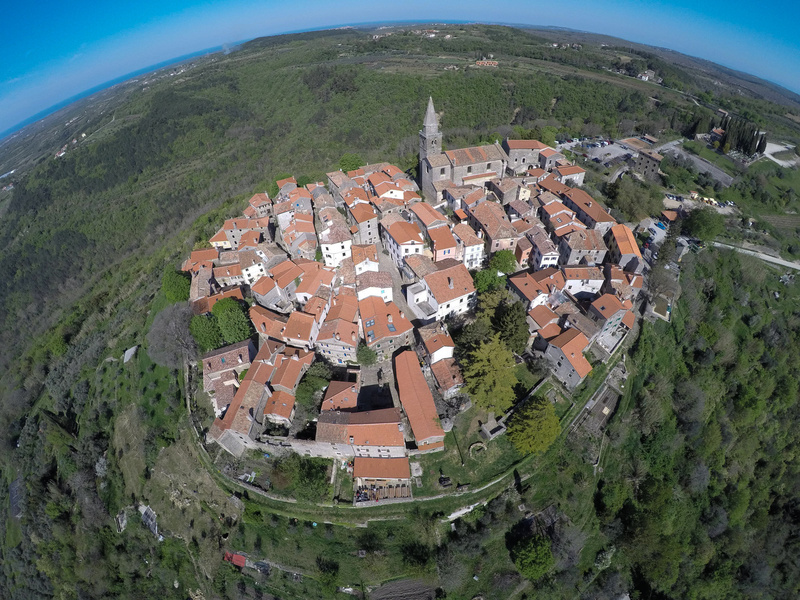 - Hot Air Ballooning: See Istria from above with a hot air balloon ride that you can schedule with Gral Putovanja. - Nearby Towns: Medieval towns around Buzet are a great way to spend afternoons. - Wine Roads: Visit wine producers on the wine roads of Buzet. - Mirna Valley: There are various well-marked trails you can explore by walking or cycling. - Istarske Toplice: A health spa famous since Roman times. It is highly ranked among the therapeutic hot springs in Europe for beneficial effects on arthritis and skin conditions. - Pietrapelosa Castle: Nearby castle dates back to 10th century. - Accommodation: Vela Vrata, Hotel Fontana, and Vela Sterna B&B. Additional information about Buzet is available from the Buzet Tourist Board. The merry sound of music, accompanied by the creative buzz and lively color of the artists' community make Groznjan an irresistibly romantic destination. The summer music, drama, and peace-focused academies turn the quiet hill town into a cultural gem. A place where new Bohemian chic entwines amicably with Old World structures, Groznjan welcomes the creative class, having declared itself a town of artists in 1965. Set 225m up a hillside about 27km from the Porec, the town warmly welcomes visitors with authentic hospitality, opening the doors of its 14th-century Venetian splendor along with its galleries, cafes, and shops. - Town Center: Town of artists and writers, with a fun, energetic ambience. - Cobbled Streets: Enjoy walking in narrow streets paved with the cobblestones. - Panoramic Views: Small covered terraces are perfect local spots to relax after exploring the town. - Jazz is Back Festival: Traditional international jazz festival held in July. - Groznjan Musical Summer: Outdoor music concerts held in August. - Art Galleries: Groznjan includes 64 art galleries. - Art Exhibitions: Starting in May, Groznjan transforms into a hub for music, film, and art. - Street Music: Summer music, particularly jazz. - Accommodation: Rooms Svalina, Casa d’Arte, Villa San Vito, Villa Poropati, and Casa Margherita. Additional information about Groznjan is available from the Groznjan Tourist Board. Famous for many things, the hillside town of Motovun continues to entice visitors to its coordinates with a pleasant mix of old and new. There are gravestones from the first century, Venetian ramparts from the 14th century surrounding the old town, and a beautiful Venetian Renaissance church. A legendary gentle giant from Motovun represents the Croatian people in a favorite folktale. Surrounding vineyards produce well-crafted local wines. The vineyards are fabulous reasons to climb the hillside to Motovun, but they are eclipsed each July as the annual film festival gathers crowds inside the ancient walls to view creative works by European and American filmmakers. A delightful destination, imagine the Andretti brothers, Mario and Aldo, as young boys racing their hand-built wooden cars through Motovun's narrow, winding streets. - Motovun City Gate: The walk up to the town is long but enjoyable. Once you reach the gate, you’ll know you’ve arrived. - Motovun Walls: Ancient walls are well preserved, marking the outer border of this hill town. - Motovun Film Festival: Famous for its movie festival celebrating small, independent producers, the event began in 1999 and is held annually in late July or early August. - St. Stephen Church: This Renaissance parish church has a 27-meter bell tower from the 13th century. - Istra Paragliding: Enjoy paragliding over Motovun. - Truffle Hunting: Go truffle hunting in the Motovun forest with Miro Tartufi. - Parenzana Trail: This former 130 km (80 miles) long train railway, which was operational from 1902 to 1935, runs from Trieste to Porec. Its name is derived from Parenzo, the Italian name for Porec. Today it is a bike and walking path. Take the small tourist train that runs from Motovun to Vizinada or go walking to enjoy the trail. Most scenic part of the trail is section connecting Buje, Groznjan, Livade, Motovun, and Vizinada. - Motovun Group of International Publishers: A non-profit organization with about 80 members in over 20 countries, which was founded in 1977 by Bato Tomasevic and inspired by Motovun. - Accommodation: Hotel Kastel, Houses of Motovun, Villa Borgo, Le Grand Cru Villa, Apartments Galerija Motovun, and Villa Maria. Additional information about Motovun is available at the Motovun Tourist Board. Additional information about Central Istria (Pazin, Buzet, Groznjan, Motovun, and other towns) is available at the Central Istria Tourist Board.